The best reciprocating saw comes in handy for demolition and home construction projects. A reciprocating saw can make rough cuts into various materials, from metal, wood, fiber glass, wood, and plaster. Reciprocating saws aren’t just useful for demolition and home construction work. You can also use this tool in electrical, HVAC, and plumbing projects. The tool’s operation is basically simple. There’s a motor that drives its blade back and forth. The motor gives the blade enough power to cut through a variety of materials. A reciprocating saw is thus a great addition to your tool box. Find out how to find the right unit for you by reading this guide. The Dewalt DCS387B Reciprocating Saw is a lightweight, compact yet powerful reciprocating saw that ﻿I highly recommend. Whether you are a DIYer, a carpenter, a contractor, or a painter, you will likely love this unit. 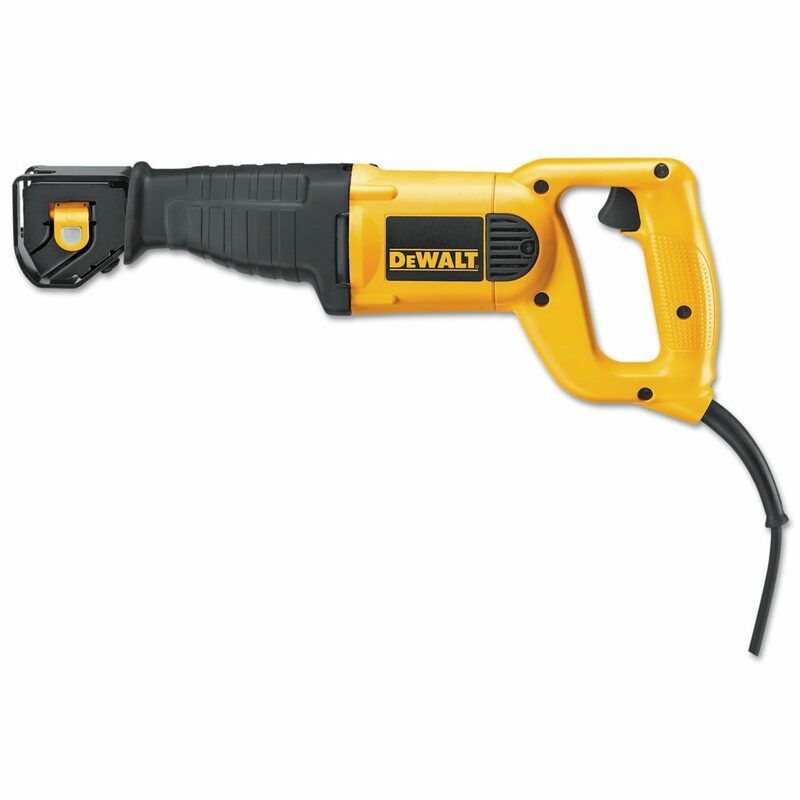 It is one of the more popular reciprocating saws from DEWALT. 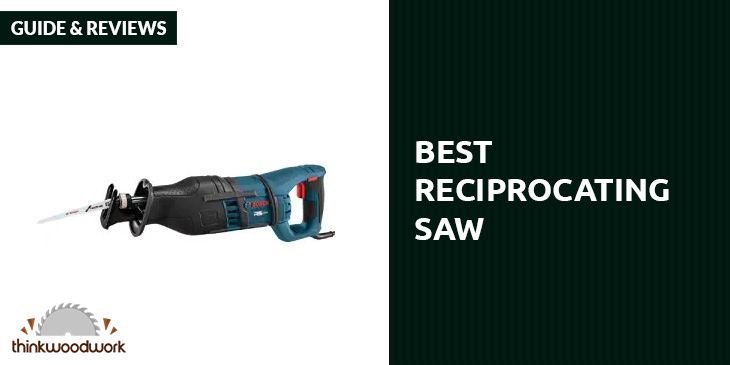 This cordless reciprocating saw is one of the lightest models in this list, weighing only 4.9 pounds. It measures around 14.5 inches long. It has a well-designed body, with the motor located on the front side of the trigger. Basing on reviews from satisfied Amazon.com reviewers, the saw feels comfortable in hand. They particularly like its ergonomically designed soft grip handle. I am also impressed with the 4 position blade clamp of this saw. This basically allows you to place the saw into anywhere you want. It also allows tool-free blade changes. Speaking of the blade, it can be installed in different orientations depending on the handle or trigger. There are some complaints, though, that the vibration of the unit can make it uncomfortable to use the saw after 4-5 minutes. 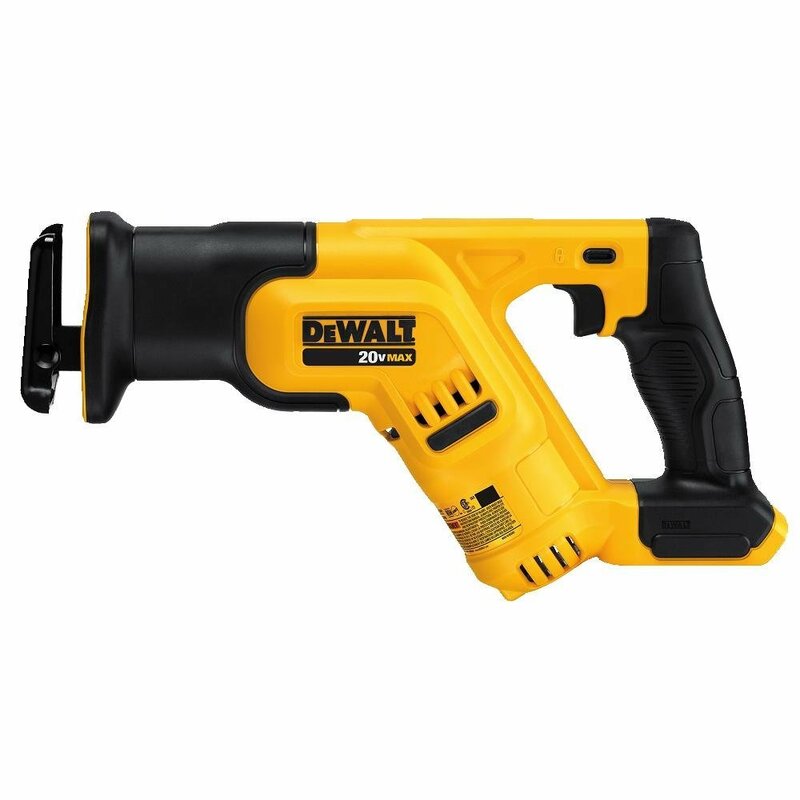 Other reviewers also think that the trigger is a bit small for their hands.It’s also a bit disappointing that Dewalt didn’t integrate a max speed control in this one. That feature could have made cutting metal with this unit even faster. As such, some Amazon.com reviewers say that they find the blade running slow when they use it in cutting metal. The Bosch RS428﻿ reciprocating saw has 14 amp motor, thus you would be able to use it for heavy duty tasks. Despite that power, this one is surprisingly lightweight at 8 pounds. The unit has a length of 22 inches. It has a decent stroke per minute of 0-2900 SPM with a stroke length of 1-1/8”. It also has adjustable shoe and keyless blade change, letting you handle various cutting tasks. Many Amazon.com reviewers have good words for this reciprocating saw. They say that it has an anti-vibration feature, so they could use it for an extended period without suffering from hand fatigue. They also love that the reciprocating saw has an ergonomically designed handle. They say the rubber grip behind the blade is very comfortable to hold.It also has a slow start function, which users say can eliminate the wrist twist typical of instant-on saw models. During actual cutting jobs, the reciprocating saw works well without the jerking motion. Many satisfied users also say that this reciprocating saw is very quiet when in operation. Although it is a corded type of reciprocating saw, the unit has a 12 feet long cord. Thus you won’t have to be restricted by its cord length. But some reviewers think that a case should have been provided due to its prohibitive price. But that really is a small issue when you consider all the good qualities of this powerful yet lightweight reciprocating saw. One of the things that really impressed me is the blade changing system of the Makita JR3050T. You can change the blade of this saw with one hand. You simply turn the twist collar, which then results to the old blade being ejected. The collar is then locked into an open position, ready for a new blade.In terms of power, you can’t really go wrong with this corded saw. It has decent power with its 11 amp motor. Its variable speed of 0-2800 SPM and 1-1/8 inch blade strokes would also facilitate efficient cutting. Another feature that I liked from this reciprocating saw is its internal dust blower system. This feature clears debris from the line of cut, which improves your visibility and thus make it easier for you to work. The Makita JR3050T also has an all-ball and needle bearings for longer tool life. The durable body design comes with a protective rubber boot, protecting the motor and bearings from dust and debris. These features go a long way towards ensuring the long lifespan of the unit. According to most reviews of Amazon.com users, the unit is very solidly built. They say it is comfortable to hold. And they don’t have any complaints at all about its performance. But there are other Amazon.com users who aren’t impressed with the unit. 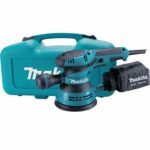 One issue they have with it is the short, one-year warranty period given by Makita. There are also those who complain about defects in the unit, like the blade locking mechanism not working. However I guess those complaints are isolated cases of unit defects that can happen to just about any other product. 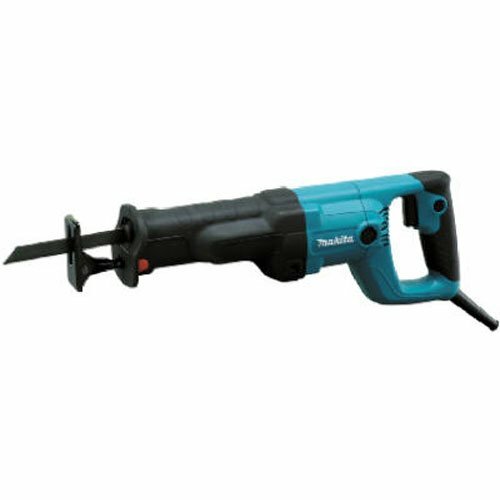 Overall, however, this Makita reciprocating saw is highly recommended for its topnotch features and well-designed body. 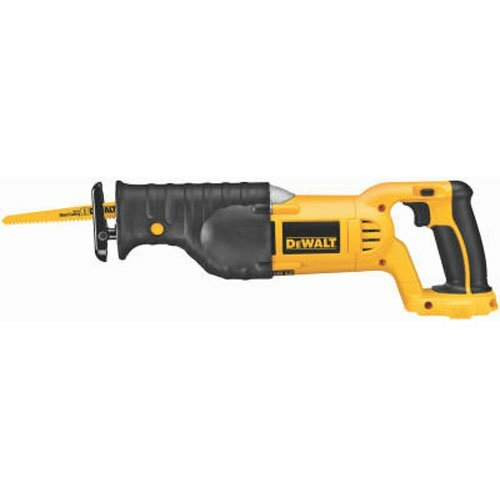 This DEWA﻿﻿LT DWE304﻿﻿ reciprocating saw can be depended upon for light and even heavy duty tasks. Its main selling proposition is the four-way blade chuck which makes cutting a lot easier. With this feature, you can use the saw and cut it in various directions without any difficulty. The four-way blade chuck also makes the Dewalt DWE304 ideal for DIYers and homeowners because they can cut in any direction. This reciprocating saw can make 0-2,800 SPMs with its strong length at around 1-1/8 of an inch. It can help you make fast and accurate cuts. It’s 10 amp motor is right in the middle as far as power is concerned. It can work well for heavy duty applications in the same way that it can be relied upon on light duty work. The case that comes with it is also very spacious. It has soft closing hinges, with enough room for the tool, manual, and a couple of blades. However, you will have to buy other blades separately because there one included in this product package is designed only for cutting metals. This reciprocating saw also gives a lot of value for money. With its good features and decent power, you would think this is an expensive unit. But no—it is reasonably priced. Some users, however, complain that it isn’t comfortable to hold especially for extended periods. If you want a unit that can get the job in the shortest possible time, then you must get this one from DEWALT. This reciprocating saw has the best when it comes to SPMs, able to drive the blade at 0-3,000 strokes per minute. Its cutting stroke length is at 1-1/8 of an inch. With so much power in this reciprocating saw, it is not surprising that many Amazon.com reviewers are in awe. Others even compare it to a chain saw which is a testament to the cutting power of this unit. This cordless unit also features a pivoting adjustable shoe with open top so you can see what you’re cutting. It also has a keyless blade clamp that facilitates quick blade changes. Plus it has sure-grip, anti-slip rubber handles that should make you feel comfortable even when holding it for a long time. It is also very durable and should last a long time. Many reviewers on Amazon.com say that their units have lasted for more than 3 years. Suffice to say, they didn’t have to return it to Dewalt and take advantage of its three-year limited warranty. This is a durable product, as proven by many satisfied users. The major issue that Amazon.com users have with this unit is its battery life. They say you can’t rely on it if you are to use it in a remote location. Another complaint is that the unit is very loud. Others also say that it would take some effort to insert the batteries in this unit. You don’t have to be a contractor to find use for the best reciprocating saw. As mentioned earlier, a reciprocating saw can be relied on for various tasks like cutting tree branches and changing PVC piping. But this doesn’t mean that all reciprocating saws are created equal. Like most power tools, you would have to look into considerations like power, ease of use, ergonomic design/handle, among others. Shopping for the best reciprocating saw can be overwhelming with the number of models in the market. Yet you can make things easier for you if you choose from any of the reciprocating saws in our list.